With recent firmware versions the OTA feature has been enabled; you can upload your sketches via WiFi without the need of an USB connection. Youll find here the instructions needed to enable this feature on your Fishino boards. If you still have an old FishinoFlashed application you need to update it. We suggest you look often for updates on this site. Prepare your board for firmware upgrade, as explained in "Firmware upgrade" section on this site. Run FishinoFlasher application, which will appear as in the picture to the right. Select a recent firmware version; the latter is the best one, of course! Select che checkbox marked "Allow sketch upload via WiFi". If this checkbox is NOT there, you've got an old FishinoFlasher and/or you selected an old firmware version. Insert a name for your board, for example "MyFishino"
Insert a port number; if you haven't a good reason to change it just leave the proposed 7777. 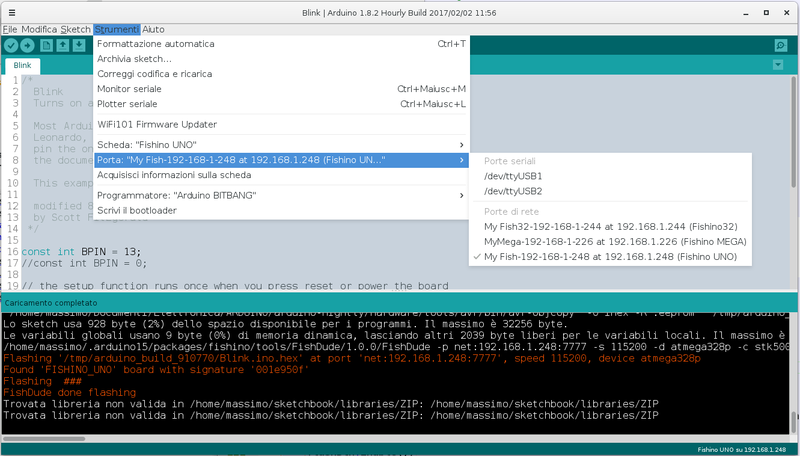 Sulla Fishino32 non è necessario eseguire alcuna connessione; l'hardware è già previsto per l'upload via WiFi. 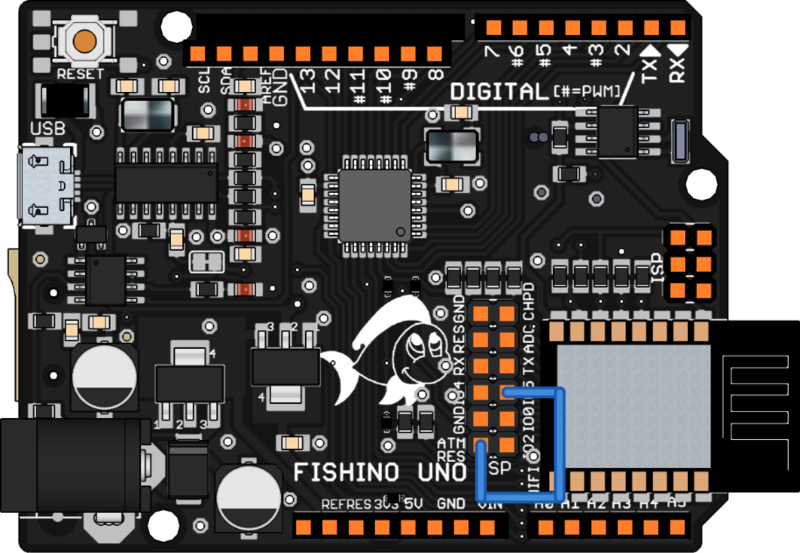 As explained above, on 8 bit Fishino boards you need a connection to enable the OTA feature; the connection is between 2 pins on the ESPCONN connector, the GPIO5 and ATM-RES. This will allow the WIFi module to reset the Atmega controller and put him in ISP (In-circuit Serial Programming) mode. Beware, without this connection you'll get a weird error from IDE when you'll try to upload a sketch via OTA. The pictures on left side shows you how to make the connection for each Fishino model. Once completed all the steps above, now you MUST upload (via USB!) a sketch that makes a WiFi connection to your Access Point, so the module can store your access credentials and use them automatically at boot. 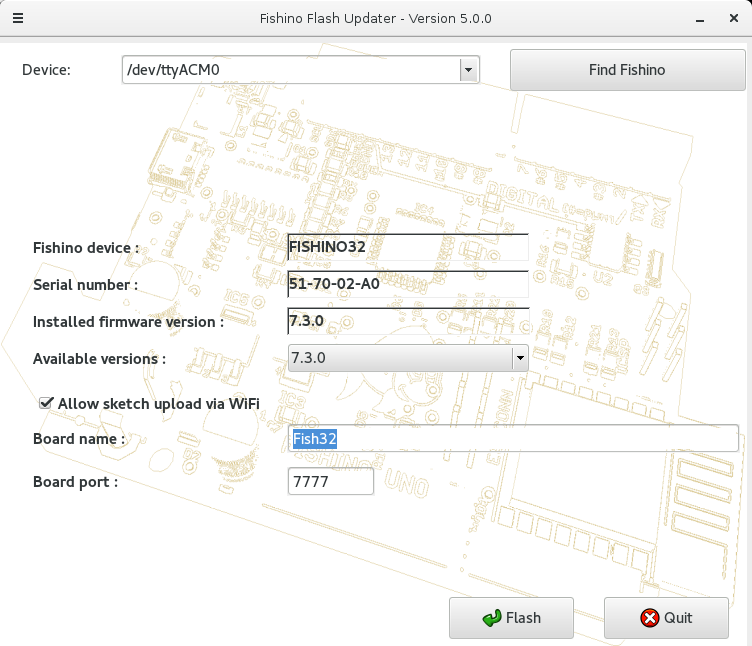 NOTE : the connection parameters used will be THE LATEST used by your sketches; if you change them and/or you'll use your Fishino in AP mode, this mode will be used on next boot by OTA too. From now, to upload your sketches it's enough to select the correct port and proceed as usual.